152 mm/50 Mk XXVI5 х 2 pcs. 180 Degree Turn Time4.74 sec. 533 mm QR Mk II4 х 4 pcs.
. . . Firing Range6 km. 20 mm Oerlikon Mk V10 х 2 pcs. 76.2 mm/70 Mk VI8 х 2 pcs. Minotaur — British Tier X cruiser. Atop the British cruiser line stands Tier X's Minotaur. She has a very different — and very unique — turret configuration compared to that of Neptune, and her main battery guns have a reload speed that gives Gearing a run for her money. Minotaur’s main battery is comprised of five quick-turning turrets, each with a pair of Mk XXVI 152mm rifles. The Mk XXVI is a further upgrade over the Mk XXV deployed aboard Neptune, and the reload time drops to 3.2 seconds (or 2.8 seconds with Main Battery Modification 3 installed in Upgrade Slot 6). Minotaur spits out 152mm shells at a rate that has to be seen to be believed; as insane her rate of fire is, however, its impact is somewhat mitigated by the British light cruiser line lacking high-explosive shells. Like her immediate predecessor, her main battery guns are dual purpose and contribute to her anti-aircraft suite, but while Minotaur’s overall AA impact on the battlefield will be significant, it will be less than that of a Neptune whose commander has the Manual Fire Control for AA Armament skill. Most of Minotaur’s AA punch comes from her middle ring of 76.2mm guns, leaving her with only her dual-purpose main battery guns to function as long-range AA. Her torpedoes and torpedo launcher configuration remains identical to what was found on Neptune: two four-tube launchers per side equipped with 10.0 km range torpedo that reload relatively quickly (96 seconds). She is the stealthiest of all the Tier X cruisers, able to drop her detection radius down to 9.04 km when fully rigged for stealth. Minotaur’s armor remains roughly equivalent to that of Neptune — which is to say that there isn't very much of it — and she is further hampered by how high her citadel space rides amidships. Minotaur will be punished severely for exposing her broadside to enemy battleships and heavy cruisers. Fortunately, she handles slightly better Neptune in exchange for giving up a bit of maximum range on her main battery. Just like all of her predecessors, playing Minotaur well comes down to efficient and timely use of her various consumables. She can equip Surveillance Radar ( ) or Smoke Generator ( ); neither is a bad choice, depending on how individual captains wish to play the ship. She also has the over-sized Repair Party ( ) that Edinburgh and Neptune do, as well as carrying Hydroacoustic Search ( ) by default. She's fragile and requires careful positioning and play, but Minotaur is deadly to enemy destroyers and a threat to enemy cruisers when helmed by a captain with their head in the game who doesn't expose their citadel unnecessarily. Unrivaled rate of fire among Tier X cruisers. Very powerful anti-aircraft suite; if kitted out for anti-aircraft duties, she has one of the most potent AA bubbles of any cruiser in the game. A jack of all trades: she can shred destroyers, deal with her cruiser peers, give battleships something to fret about, and be another detriment to carriers. Great torpedo range combined with the best torpedo reload of all Tier X cruisers. Has access to an enhanced version of Repair Party ( ) that allows her to regenerate large amounts health. Radar-equipped Minotaur can do stealth radar; she has 900-meter radar buffer from range to her surface detection. Can equip Surveillance Radar ( ) with a 9.9 km range and a long duration; combined with a high rate of fire, she is a nightmare to destroyers. Initial shell velocity is the same as Neptune; however, at maximum range, her shells fall back to earth slowly. Lightly-armored turrets that are disabled easily (if not outright destroyed). Cannot equip the Defensive AA Fire ( ) consumable to increase the anti-aircraft suite's potency even further. As with the rest of the British cruiser line, her reliance on armor piercing shells is at times frustrating, as they will either bounce or deal consistently low damage. Torpedo tubes are somewhat exposed and are disabled frequently when under fire. Very weak armor; she can bounce 152mm, 203mm and 220mm rounds at certain angles, but will be easily penetrated by shells larger than that. A lack of internal vertical protection also means that overmatch hits through the bow are very likely to citadel her. Cannot equip Smoke Generator ( ) and Surveillance Radar ( ) simultaneously; captains must choose their role before going into battle. As a Tier X ship, Minotaur has no additional modules to research. The choice of what to plug into Upgrade Slot 6 will heavily influence the subsequent mix of commander skills captains will choose and how their Minotaur will play. Generalist Build: Captains wishing to maintain their Minotaur in a very flexible built will likely opt to slot Main Battery Modification 3 ( ) into Slot 6. This shortens her reload up to 2.8 seconds (possibly even lower with the Adrenaline Rush commander skill). Minotaur’s AA is still fairly substantial even without AA Guns Modification 2 ( ), and she gains more offensive power with the faster gun reload. Anti-Aircraft Build: Currently the most popular build for this ship. Captains wishing to focus their Minotaur to have better AA will opt for AA Guns Modification 2 ( ) for the Slot 6 to add more AA DPS. Although her AA is completely scary, her usefulness depends whether there is a carrier in the game. This build is great on divisioning with a Tier X carrier to make sure that the carrier division has AA as a cover. Keep in mind that Minotaur can also be equipped with Surveillance Radar Modification 1 ( ) to extend her Surveillance Radar ( ) activation time up to 48 seconds. Similarly, she can also be equipped with Hydroacoustic Search Modification 1 ( ) to extend her Hydroacoustic Search ( ) activation time up to 120 seconds, allowing captains to do a cycle between the two consumables if they choose to equip the radar consumable. Both of these are available options in Upgrade Slot 2. 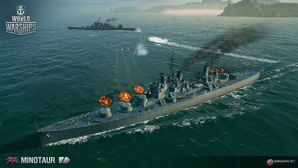 Many captains will opt for Concealment System Modification 1 ( ) in Upgrade Slot 5; however, the Unique upgrade Enhanced Smoke Generator ( ) offers another way to play Minotaur by changing her Smoke Generator ( ) style to a rolling smoke such as that found on Perth, Haida, and Huanghe. A rolling smoke differs from normal smokes in that the smoke screen generation time is very long compared to other nations but the smoke duration is very short. Using this, a Minotaur moving at 1/4 speed is able to remain in smoke for the duration of the Smoke Generator. As a high-tier cruiser, captains are recommended to equip all consumables with the premium version, which can be bought with credits ( ) or doubloons ( ). Most Minotaur captains will automatically equip Smoke Generator II ( ) for the Slot 2 just like any other Royal Navy cruiser at lower tiers. This is good on solo playing or when divisioning with a carrier to utilize her AA from within the cover of smoke. Surveillance Radar II ( ) provides a different challenge and more utility as the radar has 9.9 km range and 9.04 km detection. Divisioning with a destroyer for a smoke generator is the easiest way to play a radar Minotaur setup. Playing radar Minotaur outside of a division is much more challenging, and is only recommended for captains with excellent situational awareness. Type 1, 2, or 5 camouflage can be equipped for credits; Types 1 or 5 are recommended at a minimum to reduce detection range. Players who wish to spend doubloons can equip Minotaur with Type 20 camouflage that lowers her detection range, reduces the accuracy of incoming shells, reduces her repair costs, increases her credit earnings, and increases the amount of experience she earns. Similar to Edinburgh and Neptune, India Delta ( ) and November Foxtrot ( ) are highly recommended regardless of how her commander skills and upgrades are configured. Captains invested in the Anti-Aircraft Build will want to equip a November Echo Setteseven ( ). Minotaur opens fire on an enemy cruiser from behind an island. After being spotted, Minotaur desperately charges an enemy Yamato and fires her torpedoes. Minotaur begins evasive maneuvers to dodge incoming shells from multiple battleships. Minotaur provides anti-aircraft support for a friendly battleship. 31.5 knts at full load displacement. Line drawing of "Design ZA" on which Minotaur is based. Minotaur in World of Warships is not to be confused with the 1943 Minotaur-class cruisers, which were a modified version of the Crown Colony cruisers. The same goes for the Minotaur-class armoured cruisers from 1906. The Minotaur in World of Warships is an interpretation by Wargaming of Design ZA from 1947, which was one of many design studies in the Minotaur series of light cruiser, following on from the earlier Neptune designs. The main feature of the Minotaur designs was the use of dual purpose 6-inch/50 Mk.V (152mm) and 3-inch/70 (76mm) guns of a new design. The 6-inch (152mm) gun was the same as proposed to be used on Neptune, however a new twin turret was used, designated as the 152 mm Mk.XXVI. In 1946, in response to a request for improved habitability a new series of cruisers were designed, which utilised the new two-gun 6-inch Mk.XXVI turrets. These designs were designated as different versions of Design Z, and when compared with Neptune in June 1946, Sketch D, one of four versions of Design Z proposed was selected for further development. 'Sketch D' had five of the new Mk.XXVI turrets, three super-firing forward, and two aft, and a secondary dual purpose battery of Sixteen 3-inch/70 guns, which eliminated the need for any smaller anti-aircraft guns. The machinery of Sketch D was provided in 4 combined boiler and engine rooms, and the standard displacement was 15,530 tons, while being 10ft shorter than Neptune, at 645ft (197 meters) long. Sketch D was further refined and became known as Design Z4C, and then Minotaur, to avoid confusion with the previous designs. Designs ZA and ZB appeared in 1947, as a smaller alternative to the earlier Minotaur designs, which only offered a small improvement in terms of size and cost over the Neptune designs. ZA kept the same armament of the earlier designs, 5 twin turrets housing the dual purpose 152mm guns and 8 twin 3 inch (76mm) /70 calibre dual purpose guns, but on a smaller hull. The most visual change was 'B' turret being lowered to the deck level, no longer super-firing over 'A' turret. She was 616ft long (187.8m), with a standard displacement of 13,870t and 16,760t at full load. She kept the machinery layout of the earlier design 'Sketch D'. Design ZA achieved 770t of weight savings in the hull over Sketch D/Design Z4C, courtesy of being smaller in length. A proposed compliment was 1090 crew members. Also first appearing in 1947 were versions of the design designated Design P, Q, R and S, with alternate versions called P1, Q1 and so on. These designs varied the armament and size of the proposed new cruisers, ranging between six and 10 6-inch guns, and up to 21,000 tons in displacement. Six cruisers were planned to be built, potentially to a Minotaur design like ZA or Z4C, keeping the same names from the five planned Neptune cruisers; Neptune, Bellerophon, Centurion, Edgar and Mars, while adding Minotaur as a sixth ship. In mid-1947, it was projected that two cruisers could be laid down in 1951, 1952 and 1953. This was later revised to two cruisers by 1954, after a 5 year break in building ships larger than a frigate. However, due to the financial nature of the United Kingdom at the time, it became apparent that such cruisers wouldn't be completed for several years, and would be prohibitively expensive, so the cruisers were never laid down or ordered. The 6-inch (152mm) Mk.XXVI mount and 3 inch/70 (76mm) dual purpose guns proposed for the Minotaur designs were eventually used on the later Tiger class cruisers. It is unlikely that twin mount 20mm Mk.V Oerlikons would be fitted to a ship that would most likely be completed in the 1950s. A more realistic light AA weapon for the ship would be 40mm Bofors, possibly the twin RP50 Mk.V 'Utility' or heavier Mk.II'STAAG' mounts amidships in the superstructure, and single 40mm Bofors Mk.VII or "Boffin" mounts on the open fore and aft decks. 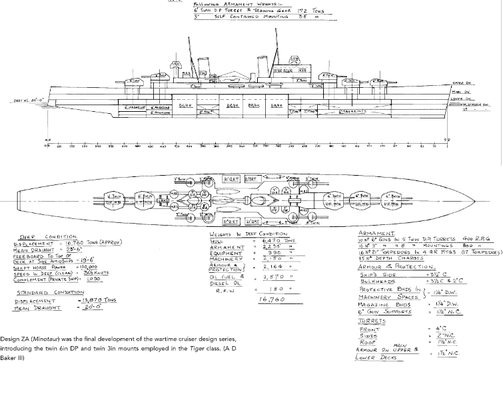 The design sketch for Design ZA features the early LRS-1 (Long Range Surface) fire director on the fore and aft superstructures, however in game a previous cruiser fire control director is present in both cases instead. The armour model of Minotaur differs in some regards to the design sketches, most prominently, the main belt is 101mm thick in game compared to 89mm as designed. This could be explained by the inclusion of backing plate in the thickness of the armour belt. This page has been accessed 147,029 times.